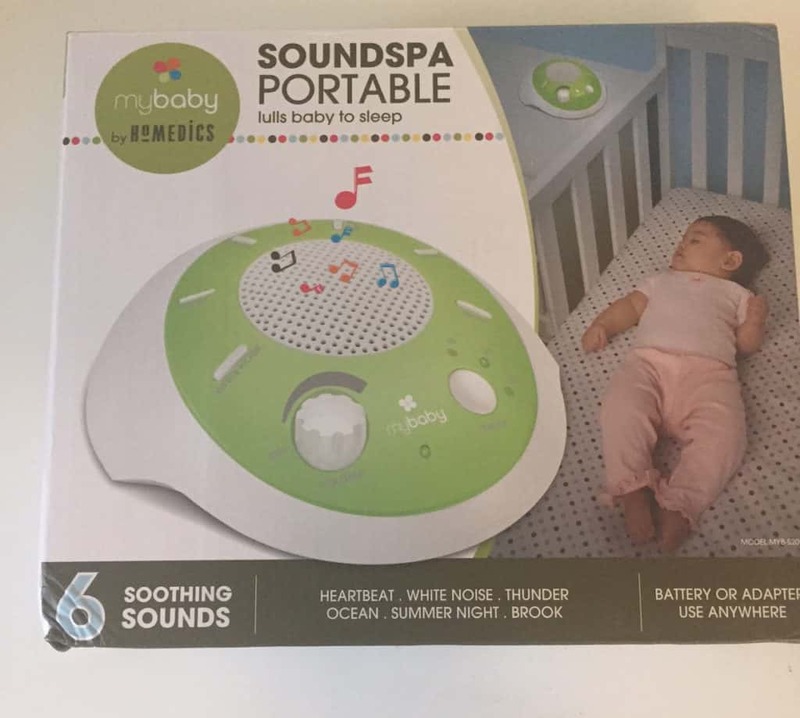 The final baby sound machine for review is the myBaby SoundSpa Portable by Homedics. 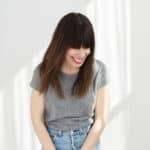 Read on for my thoughts and feedback on this sleep option for the wee ones. 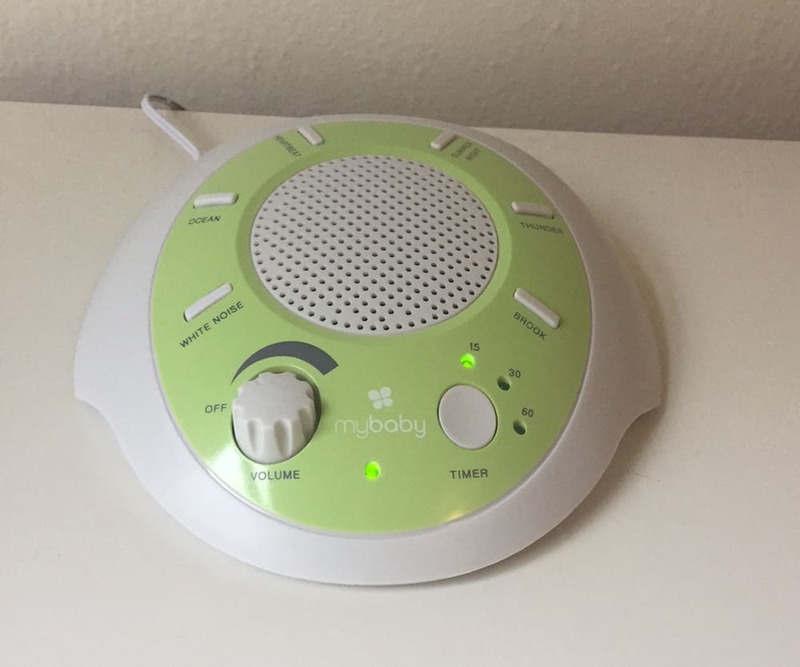 Compact and packed with a ton of calming sounds, the myBaby SoundSpa machine is a real winner! The myBaby SoundSpa Portable is small, almost petite, sound machine. White with green trim that highlights the various sound options and features, there is a round speaker in the center that amplifies the sound. This lightweight plastic model, necessary when “Portable” is in the title, comes with 6 sounds: Heartbeat, White Noise, Thunder, Ocean, Summer Night and Brook, and a 15, 30 and 60 minute auto-off timer. It comes with a power cord but also has the option to be battery powered, a necessity when on-the-go. There is a limited one year warranty. Ocean – a bit intense, though better when the volume is turned down. Straight-forward and simple to use the SoundSpa is very intuitive. Plug in the machine, turn the dial switch to turn on the machine, the same dial also serves as the volume control. Select the sound you want to hear and if needed, choose one of the timer options: 15, 20 or 60 minutes. To insert the batteries, unscrew the back of the machine and insert 4 AA batteries. Upon first examination I was not very impressed with the SoundSpa sleep machine, physically it felt flimsy and I feared it would not survive a night in my house. But, after trying it out, I found I liked the sounds. Even the heartbeat option did not feel creepy to me, as it often does in other models. Though not the most hefty of sound machines on the market, the sounds and size work in its favor. 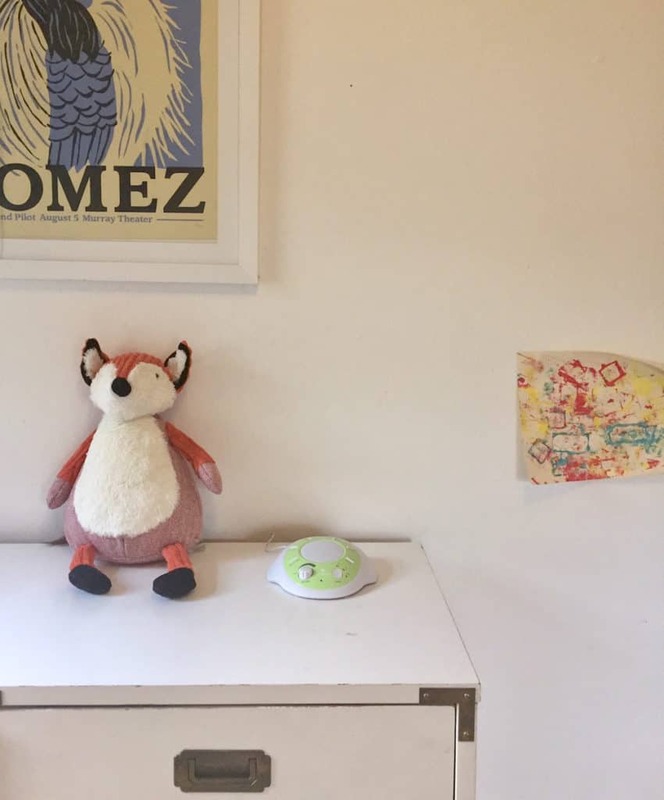 The small size is especially nice for infants whose own spaces tend to be smaller in nature, especially in larger cities like where I live. Added bonus that this model is a featherweight compared to other options of similar quality in the sound machine world. This means that it won’t be something that tips the scale weight of an already hefty diaper bag. My only complaint about the SoundSpa is the quality of the speaker. Though, not that I was expecting something insanely impressive, it teeters on the edge of sounding blown out at mid-volume on some of the sound effects: i.e – larger waves crashing, the more prominent thunderbolts. With that in mind, this machine could be more ideal for those not living with constant, loud noises that could interrupt baby’s slumber. The speaker quality is not strong enough to be turned up to a volume level that could adequately drown out thundering sounds. The SoundSpa sleep machine is not as readily available as other sound machines I have reviewed, but can be sourced at both Target and Amazon for $24.99. Parents of young babes are big fans of the SoundSpa for two main reasons: price and portability. The complaints over the SoundSpa consistently pertained to the inconsistent quality and flimsy make of the product. 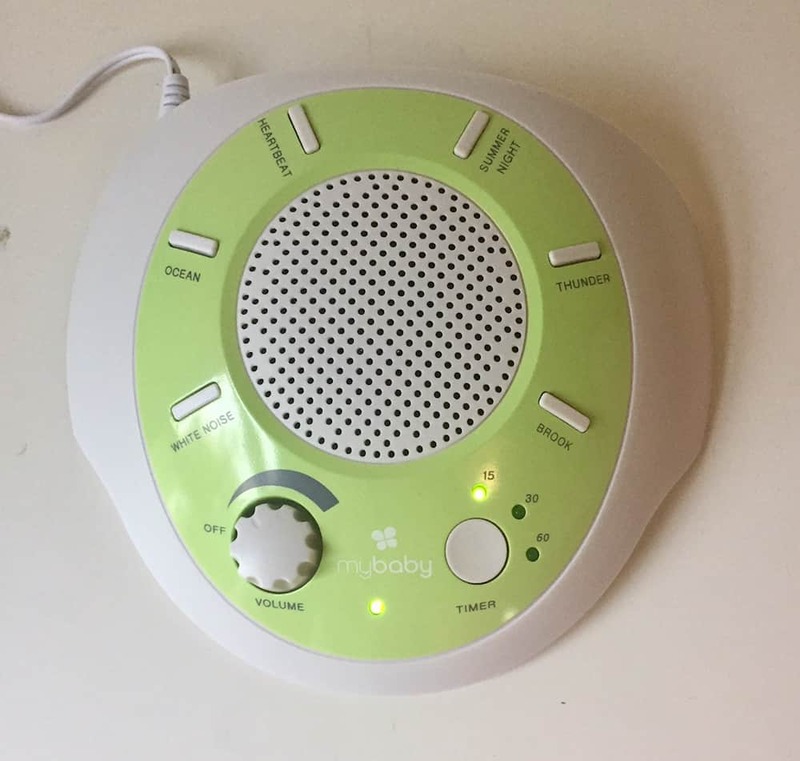 Most baby sound machines, unless adopted by a parent or older sibling, are used for a definitive amount of time. Personally, I found that as my children grew their need for white noise expired. This machine stands out for its price point and portability, making it a front-runner in the market. The fact that the SoundSpa is small, very lightweight and incredibly affordable are major selling points for me. I remember when I had young babies the need for consistency in bedtime routines. I would have appreciated being able to easily transport the same sound machine I had at home to other destinations. At the end of the day, all a sleep-deprived parent wants is for their child to sleep, so they too can sleep. This is a sound machine that could help accomplish both of those goals. Ready to by the myBaby SoundSpa? Pick it up on Amazon!